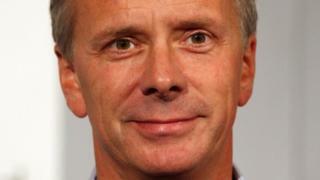 ITV director of television Peter Fincham is leaving the post after eight years, it has been announced. Managing director of ITV Studios Kevin Lygo will replace him next month. Fincham said it was "time to do something different" but added that while he had "no firm plans", he would consider a return to the indie sector. ITV's chief executive Adam Crozier paid tribute to Fincham as a "great creative partner" and added that he was "delighted" by Lygo's appointment. Julian Bellamy, managing director of ITV Studios in the UK, will succeed Lygo. Lygo and Bellamy start their new roles on 1 February, with Fincham staying until the end of March to complete the process of handing over the role. Fincham, former controller of BBC One, said: "This is a personal decision that I have been thinking about for a good while. "By the time I leave at Easter I will have been a channel controller at the BBC and ITV, amazing as it seems, for 11 years. Quite simply, it's time to do something different." He said he had worked at ITV "during a period of great revival", and added: "I haven't made any firm plans for the future yet, but I wouldn't rule out a return to the indie sector - I ran TalkBack for a lot longer than I've been on the broadcasting side and that indie heart has never quite stopped beating. " His commissions for ITV include Downton Abbey, Broadchurch, Long Lost Family and The Only Way is Essex. Crozier said: "Peter came to see me in September to say that he wanted to step down and whilst I am sorry to see him leave, eight years is a long time and I fully respect his desire for a new challenge." He added Lygo was "perfectly placed to lead the commissioning team as we enter this next exciting phase". Lygo - Channel 4's former director of television - said: "I've had a terrific time over the last five years building ITV Studios in the UK and internationally into the success story that it is today, but the chance to become director of television of the UK's biggest commercial broadcaster was just too good to miss." ITV also announced David McGraynor, ITV Studios finance director, was to become the chief finance and operating officer of the studios division.